"This innovative attachment couples with the convenience and portability of the Ergo System to deliver a lightweight yet formidable hydrodemolition solution." "This innovative attachment couples with the convenience and portability of the Ergo System to deliver a lightweight yet formidable hydrodemolition solution," said Roger Simonsson, Aquajet Systems managing director. "Its powerful water jets efficiently take on concrete removal and repair in some of the most challenging spaces to work, opening up the productivity of robotic hydrodemolition to nearly anybody in any location." 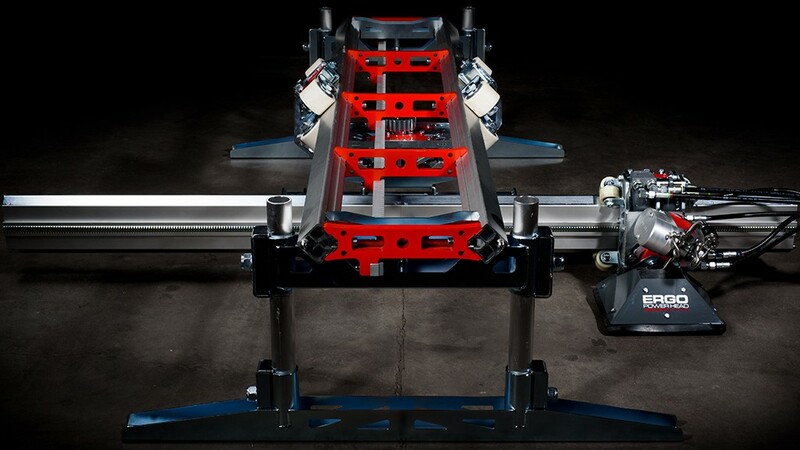 The Spine includes an Aquajet Power Head attached with a single bolt to a roller beam, which is connected to a spine roller mounted on a spine rail. Depending on the configuration, the setup may be supported by standard support legs, or the spine rail may be attached directly to a surface. The Ergo Power Head can tilt at up to a 45-degree angle to attack the material efficiently and oscillates to get the best results for each job. Aquajet manufactures the roller beam with a lightweight aluminum core coupled with a steel gear rack and guide rails. Beam sections are mounted together with a single bolt. The Ergo Spine roller features a low-weight, high-strength skeleton base with a wheel setup that divides forces for the ability to handle high reaction forces. The spine rail is fabricated with high strength aluminum, reducing its weight by half compared to steel. A 6.6-foot (2-metre) rail weighs just 44 pounds (20 kilograms). Despite its lightweight properties, the rail handles the same reaction force as an entirely steel rail. The rail allows for quick connections with a single bolt for different brackets and tools. The Ergo Controller's intelligent sensing controls automatically adjust and move the Power Head along the roller beam. Aquajet's high-pressure Power Pack, sold separately, provides water pressure and flow to the Power Head´s lance and nozzle, creating a reaction force up to 1000N. The Ergo Power Head can tilt at up to a 45-degree angle to attack the material efficiently and oscillates to get the best results for each job. As the Power Head moves along the Ergo Spine, it removes concrete in sections as small as 9.8 inches (0.25 metres) up to 6.6 feet (2 metres), leaving the rebar clean and undamaged. An Ergo Spine with a Power Pack producing 40,611 psi (2,800 bar) of pressure and 10.6 gallons (40 litres) of water per minute can remove an estimated 8.8 cubic feet (.25 cubic metres) of concrete per hour. The Spine simplifies use as well as maintenance, and is highly portable. As the Power Head moves along the Ergo Spine, it removes concrete in sections as small as 9.8 inches (0.25 metre) up to 6.6 feet (2 metres), leaving the rebar clean and undamaged. An Ergo Spine with a Power Pack producing 40,611 psi (2,800 bar) of pressure and 10.6 gallons (40 litres) of water per minute can remove an estimated 8.8 cubic feet (.25 cubic metres) of concrete per hour. The Spine simplifies use as well as maintenance and is highly portable. One person can carry and set up the unit and secure it with a single bolt. All connection points are marked in red, and all bolt sizes on the unit are the same, so just one tool is required. Further, the wheeled Controller measures just 3.6 feet (1 metre) tall and 1.4 feet (0.42 metres) wide, making it easy to get to the jobsite on a pallet and then move effortlessly around the site. The Spine's standard setup easily tackles concrete walls, floors and ceilings while the side setup delivers hydrodemolition power to narrow spaces.